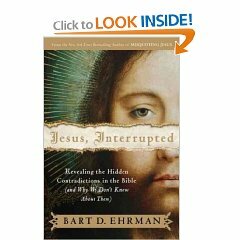 When I made the announcement a couple of weeks ago that I would only review books I had purchased myself, I forgot I had one more review copy on the way — Bart Ehrman’s Jesus, Interrupted. But, to keep faith with my promise, I am donating the Amazon price of $17.15 to a local missions project to repair fire damage to a home just outside Chatham. Now, on to the book. Ehrman teaches religious studies at the University of North Carolina in Chapel Hill, about an hour’s drive from our town. In the book’s introduction, Ehrman tells the story of leaving his conservative evangelical upbringing, ala Wheaton and Moody Bible College, when he came face to face with the historical critical method at Princeton University. At that point, Ehrman is not unlike other seminarians who have moved from a devotional view of the Bible to a more detached, scholarly viewpoint. Ehrman identifies himself currently as an agnostic because he cannot come to grips with the problem of suffering and pain in this world. Again, not a big surprise as one of the age-old questions is the problem of evil. But, Ehrman is not content to leave the great gulf between the academic world and the local church unbridged. He comments more than once in this book, “But most people in the street, and in the pew, have heard none of this before.” This being the finding of the school of historical criticism. It seems to be Ehrman’s mission to right this egregious wrong in his newest book titled, Jesus, Interrupted. That each book of the New Testament should be allowed to speak for itself. That some books and accounts contradict others. That ascriptions of authorship are not reliable. That the Bible is replete with errors and contradictions. That Jesus may have been an historical person, but his legend has been reinvented by followers. Okay, that’s a lot to deal with, but let’s get started. For Ehrman the differences in the Gospel accounts and the different emphasis of each Gospel is a big problem. For him, these differences are not just differences of points of view or emphasis, but huge contradictions with massive amounts of editing, redaction, and other manuscript chicanery. Then, after saying all of that, he wonders why pastors don’t tell their flocks that the Bible is basically a totally-human, error-ridden fabrication. It’s obvious that he’s not a pastor. When it comes to Jesus, Ehrman dismantles C. S. Lewis’ apologetic of ‘liar, lunatic, or lord’ simply by saying that Jesus never claimed to be God, therefore Lewis begins with a faulty premise. Seems very neat and academic, but Ehrman contends that the stories of Jesus were spread by oral tradition, much like the children’s game of ‘telephone’ (we called it ‘gossip’). In other words, the Jesus stories went from one source to another orally with no controlling corrective voice. But, the New Testament itself seems to contradict Ehrman. Some very prominent voices like Peter, Paul, John, and others loom large in the telling of the stories of Jesus. Ehrman dismisses these as being forgeries, or wrong ascriptions. Matthew did not write the gospel attributed to him, and so on. But, even if Ehrman is right about the exact authorship of the gospels (which I don’t think he is), logic would indicate that the leaders of the early church would be the authorities for the stories of Jesus. But Ehrman says, “Did you or your kids ever play the telephone game…?” He goes on to say that the stories of Jesus get told “for forty or more years, in different countries, in different contexts, in different languages. What happens to the stories? They change.” But he totally ignores the strong possibility that the early church leaders like Peter, Paul, John, James, and others would have been the central source for the Jesus stories, and not comparable to the game of “telephone” he describes. The book for all its claim to be the academic truth is obviously written for a popular audience. Ehrman offers no footnotes or citations, relying instead on 4-pages of “notes” at the end of the book to provide both verification and explanation for some of his more difficult points. In short, there is not much new to Ehrman’s book. If you are familiar with the historical critical method, then you don’t need to read Jesus, Interrupted. If you are not, there are insufficient references and notes to fortify the author’s argument and point the real student toward his primary sources. Just because Ehrman cannot understand why the average person in the pew hasn’t heard this stuff before doesn’t mean this is the book they should hear it from. If you want to engage on a scholarly level Ehrman’s book fails. If you want a popularization of historical criticism, then Ehrman comes close. But his sweeping generalizations (everyone teaches this, all pastors have heard this, the Bible is full of contradictions, etc) leave one wanting to know more about each allegation. In the end, Ehrman is neither compelling enough, nor scholarly enough to turn Jesus, Interrupted into the next status-quo-shattering book when regarding biblical study. I wasn’t offended by Ehrman, but then neither was I convinced that all his statements were sound. Jesus, Interrupted is an interesting attempt to popularize a difficult subject. Ehrman only gets part-way in his attempt.